In a recent post on Wikipedia in universities and colleges? published on the JISC blog Amber Thomas mentioned her contribution to the Eduwiki 2012 conference which took place in Leicester last week. Amber’s post included a poster entitled JISC on C21st Scholarship and the role of Wikipedia which I’ve embedded in this post. Amber described the image as an “infographic” which generated some debate on Twitter regarded the difference between an infographic and a post. Thus led to recollection of a passionate discussion at the IWMW 2012 event on the difference between infographics and data visualisation. It seems that data visualisation provides a view on an entire data set, whereas an infographic is a lossy process which focusses on a particular aspect of the data which the creator of the infographic wishes to focus on. A poster might be described as an infographic without the data. 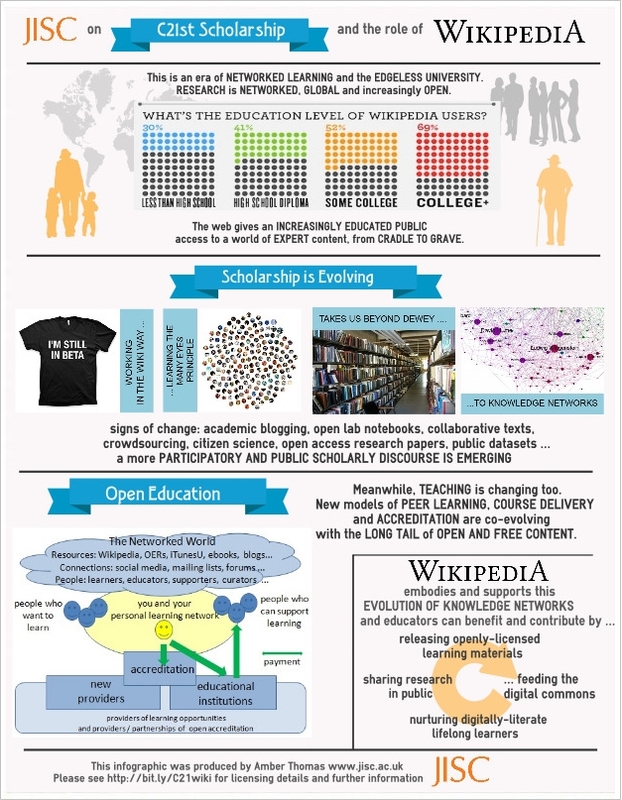 The accompanying image does, in the depiction of the education level of Wikipedia users, a certain amount of ‘infographical’ information, but the remainder is a poster. I think we can conclude that there are fuzzy boundaries between posters and infographics. This is probably, however, less fuzziness between those who find infographics useful and those who dismiss them as marketing mechanisms for presenting a particular viewpoint, but hiding the underlying complexities. This, at least, lay behind the passionate discussion that took place late one evening at IWMW 2012! Such discussions frequently take place in the context of scientific communications. There are those who value the importance of communicating the implications of scientific research to the general public and feel that going into the details will tend to alienate the public. However such approaches can be dismissed by others who feel that such approaches results in a dumbing-down of the complexities. I came across these issues earlier this year when I spoke at a day’s event on “Dealing With the Media” organised by the AHRC (Arts and Humanities Research Council. The event was aimed at recipients of AHRC grants and outlines the experiences of those who had been successful if maximising the visibility of their research through online pharmacy 24×7 engagement with mass media. Other speakers described strategies for ‘selling’ your story to those who would commission articles for the BBC or publications such as the Guardian and the Times Higher Education. The importance of giving a brief and simple message was made by a number of the speakers. I am in favour of use of infographics to help put across complex arguments. I was particularly impressed with Amber’s approach, as she not only produced the infographics which I have illustrated but also integrated the points given in the infographic in the slides she used in her presentation. In addition Amber has provided a document giving the source of the materials she used in her presentation. Amber seems to be suggesting approaches which could benefit others who might wish to enhance the impact of their work. This is, of course, of importance across the sector as can be seen from the EPSRC’s recent announcement of their Impact Toolkit. This addresses areas such as What is impact? ; Why make an impact? ; What the ESRC expects; How to maximise impact; Developing a strategy; Impact tools; Taking research to Westminster; Contact government organisations; Getting social science research into the evidence base in government; Knowledge exchange; Public engagement; Impact resources and ESRC Pathways to Impact for Je-S applications. It strikes me that as well as learning from such resources, it may also be helpful to share the tools and the approaches taken in producing infographics and posters. It may be that such work will be provided by a graphics unit who have expertise in this area. But this may only be a realistic solution for high profile outputs. Perhaps we should all seek to develop expertise in this area? The tool Amber used in the production of her poster, easel.ly, might provide a useful starting point. We can find examples of other tools for creating infographics which are available. But perhaps more importantly besides Amber’s example has anyone examples of good posters and infographics related to development work which we can learn from? NOTE: Tony Hirst has provided Delicious bookmarks of services for creating infographics which include Piktochart- Infographic & Presentation Tool, Venngage, infogr.am and easel.ly.